Source: PESA Switching Systems, Inc.
With e-Route it is now possible to control PESA routing switchers over the internet or an existing LAN/WAN. e-Route can be used with large multi-level switchers or smaller dedicated routers such as the Bobcat, LNS-8, or Ocelot. The e-Route Server provides a network interface and a switcher interface. Users access the e-Route Server using popular Internet browsers. The e-Route Server is a rack mounted industrial product that will support multiple simultaneous users. It can be readily customized and scaled upwards for demanding applications. The e-Route server uses an ethernet port for network connection (LAN/WAN or Internet), and a RS232/422 port to interface with a PESA router controller. e-Route relies on TCP/IP protocol to communicate over the network and CPU link serial protocol to connect to the router. 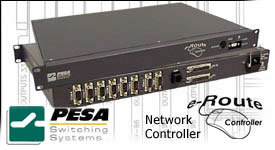 PESA Switching Systems, Inc., 35 Pinelawn Road, Suite 99E, Melville, NY 11747. Tel: 631-845-5020; Fax: 631-845-5023. Suan Waren, Sales Business Mgr.